Students and teachers alike are preparing for the new academic year this month and it seems that summer has gone by too fast (it always does!). Brighten up their back-to-school blues with colorful cupcakes! Here are some school-themed sweet treats that we decorated and donated to the students and staff at Islander’s brother’s school. We looked at different Google images, studied how others decorated their cupcakes and made an educated guess on how to create our own. We got an A+ from the appreciative recipients. 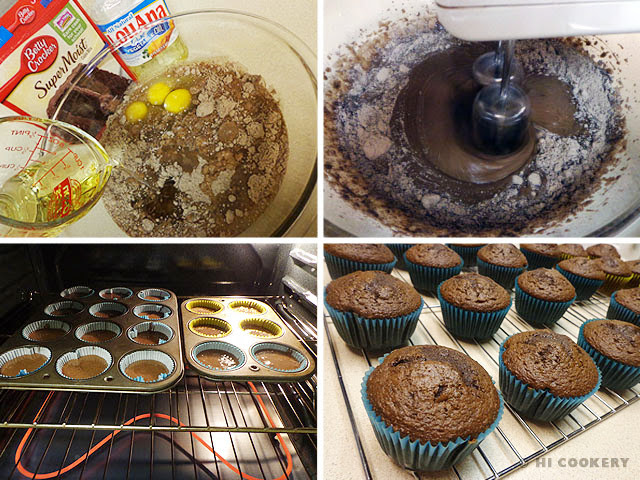 Learn how to make back-to-school cupcakes by following the photo tutorial below. 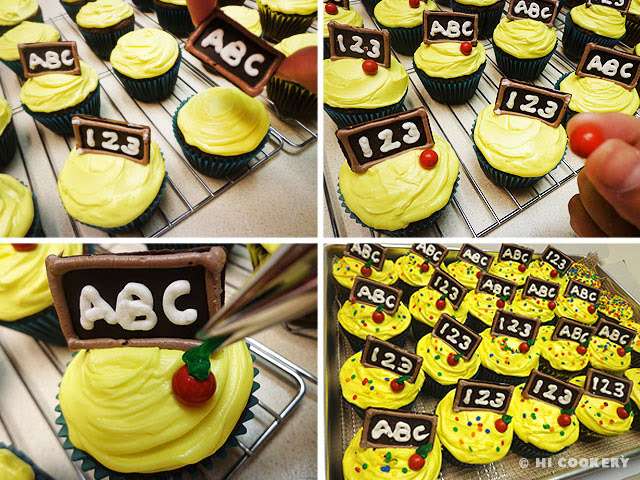 Decorating them is fun and as easy as ABC and 123!!! Prepare the batter and bake the cupcakes in colorful paper liners. Cool completely. Generously ice the tops of the cooled cupcakes with brightly colored frosting. Unwrap the mini chocolate bars. Outline the back edges with chocolate fudge frosting. Write letters and numbers using the white tube frosting. Position the “chocolate chalkboards” slightly off-center on top of the cupcakes. Place a red round candy by the chalkboard. Pipe a small leaf using the green tube frosting to complete the “apple.” Sprinkle colorful nonpareils on top (optional). 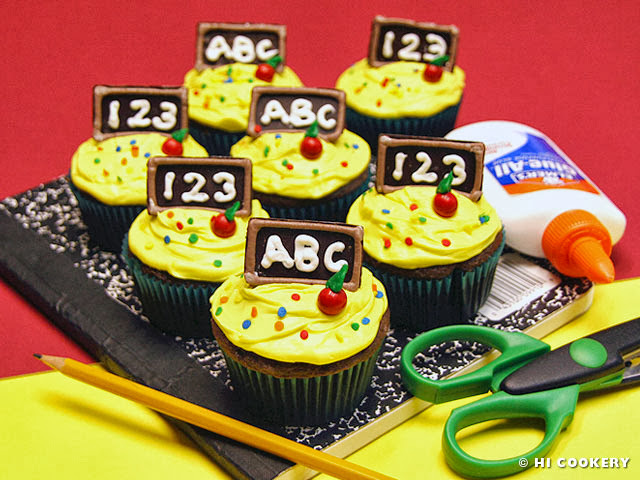 These cupcakes are perfect for parties with an education theme. Search our blog for other cupcake decorating ideas. As an alternative to cherry pie or tarts, Highlander indulges in cherry turnovers once in a while. 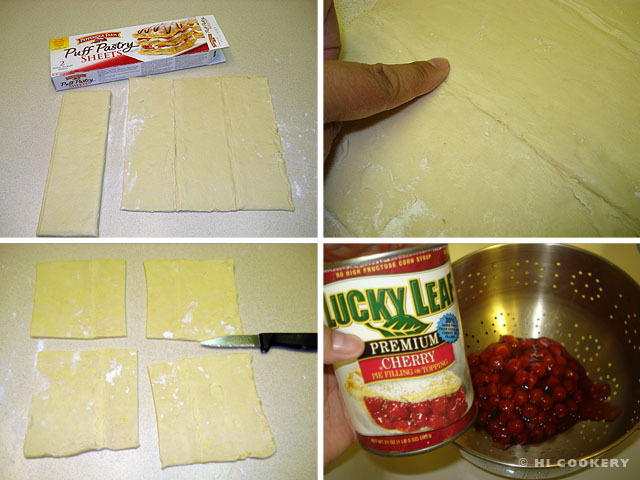 Like his favorite cherry pie pockets, these sweet snacks are portable and petite and an easy-to-make treat! These dessert dumplings are prepared with puff pastry encasing cherry pie filling. The technique is to “turn over” the puff pastry squares into triangular shapes, hence the name. 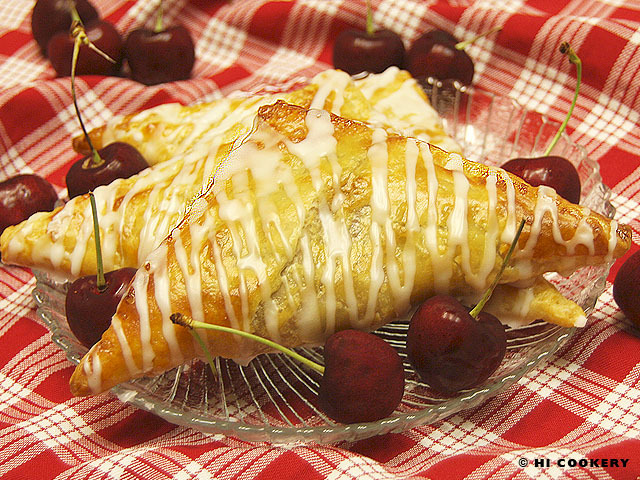 Try this turnover recipe for a tasty pastry on National Cherry Turnover Day. Thaw the frozen puff pastry according to the package directions. Unfold each sheet on a lightly floured surface. Lightly press finger to smooth out the folded creases. Cut each sheet into quarters for a total of eight squares. Drain the cherry pie filling in a colander. Spoon the filling in the middle of each puff pastry square. Moisten the edges with egg wash. 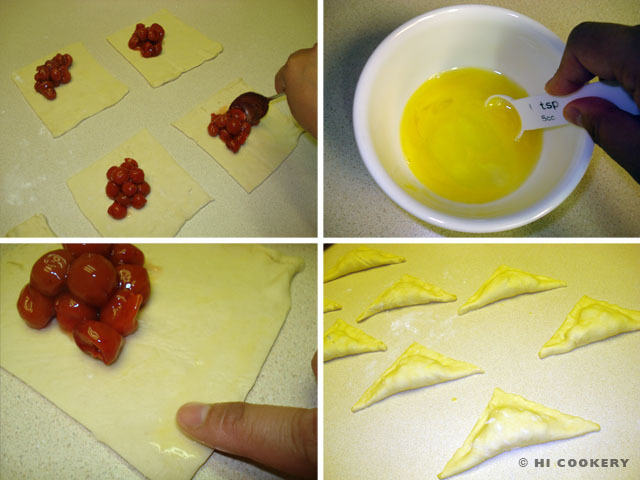 Turn over and fold the pastry square in half to make a triangle; repeat for all. Seal the edges with the tines of a fork. 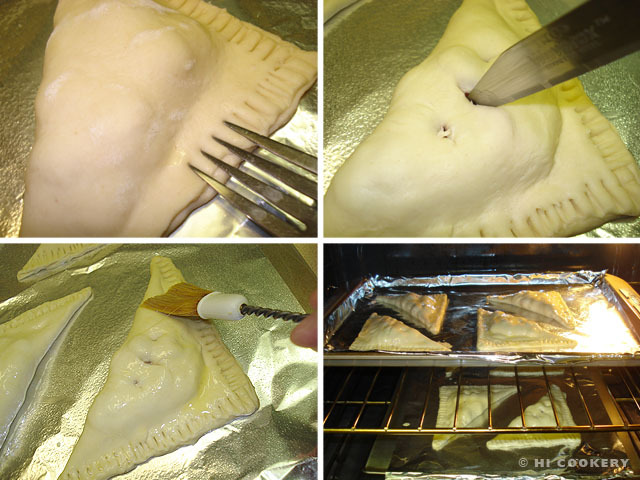 Cut small slits with a knife to vent the turnovers. Place on a foil-lined baking sheet that has been lightly greased with cooking spray. Brush the tops with egg wash. Bake in a preheated oven at 400 degrees F for 10-15 minutes until golden brown and puffed. Remove from the oven. Meanwhile, in a bowl, make the glaze by stirring the milk/water/kirsch into the powdered sugar until smooth. Place in a zip-top plastic bag. Snip a small hole at the point of the bag. 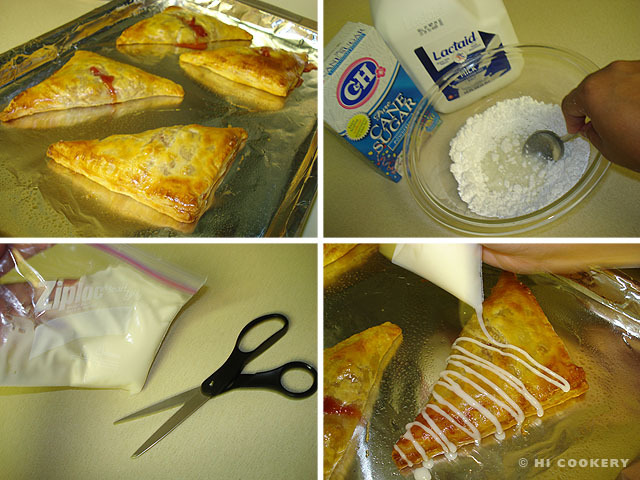 Drizzle the glaze over the cherry turnovers. Let set slightly. Serve while warm. Instead of drizzling glaze over the baked turnovers, try sprinkling a bit of turbinado/coarse sugar or sliced almonds on top of the egg wash before baking them. Check out other cherry recipes by searching our blog. Pecans are popular in the South (especially in South Texas where we live) and we have put them in pies, cookies, cakes, tarts and now a torte. Like the Pioneer Woman’s “Texas Fudge Sheet Cake” recipe, Southern celebrity chef Paula Deen’s “Fudge Pecan Torte” is its richer cousin. Both cakes are deliciously fudgy, but the torte is also studded with pecans and slathered with a silky-smooth icing. While the sheet cake is a casual crowd pleaser at potlucks, the torte is a decadent dessert centerpiece and showstopper at posher parties! 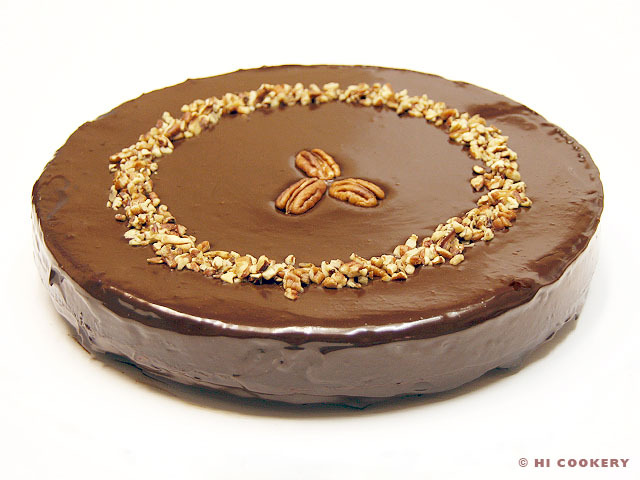 Indulge on National Pecan Torte Day with this Fudge Pecan Torte recipe. Grease a 9- or 10-inch springform pan. Line the bottom with parchment paper and grease it as well. 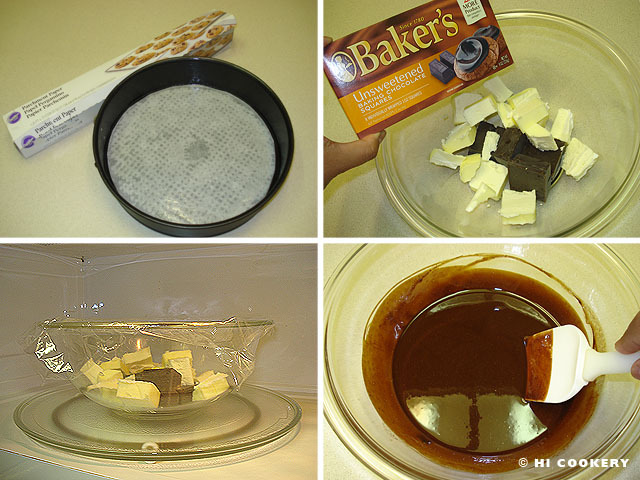 In a microwavable bowl, place the butter and bittersweet chocolate. Microwave until it is melted (about 1 ½ minutes). Stir until smooth. Set aside to cool slightly. In another bowl, mix together the flour, baking powder and salt. In a mixing bowl, beat the eggs with the sugar. 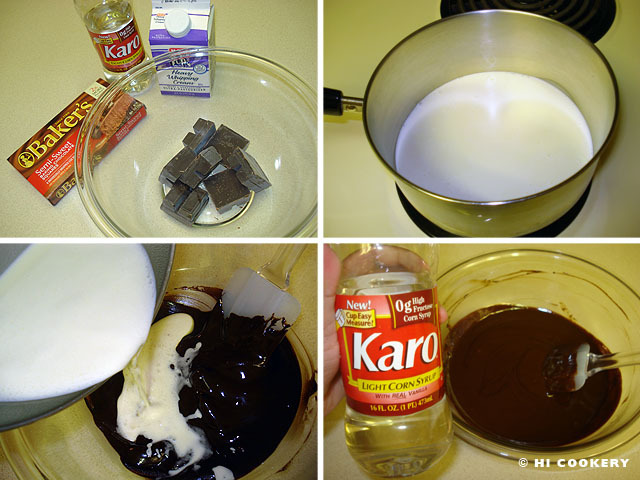 Pour in the melted chocolate and blend well. Stir in the coffee liqueur. Gradually add the flour mixture. Fold in the pecans with a spatula. Pour the batter into the prepared pan. Bake in a preheated oven at 350 degrees F for 40 minutes, testing for doneness with a toothpick. Remove from the oven and let cool completely on a wire rack in the pan. 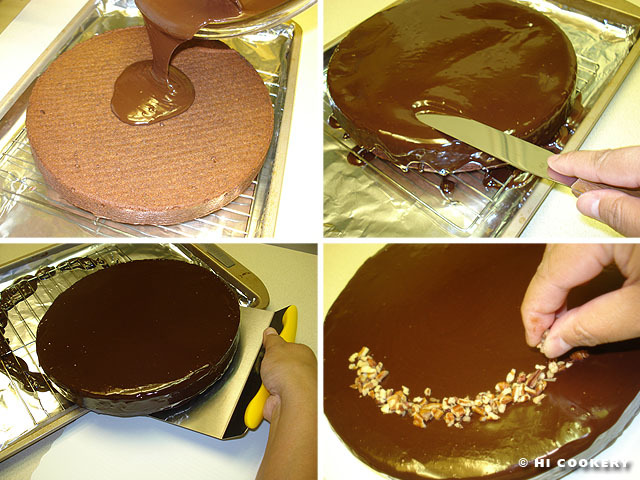 Invert the torte onto a wire rack set over a lipped pan lined with foil. Carefully peel away the parchment paper from the top of the torte. 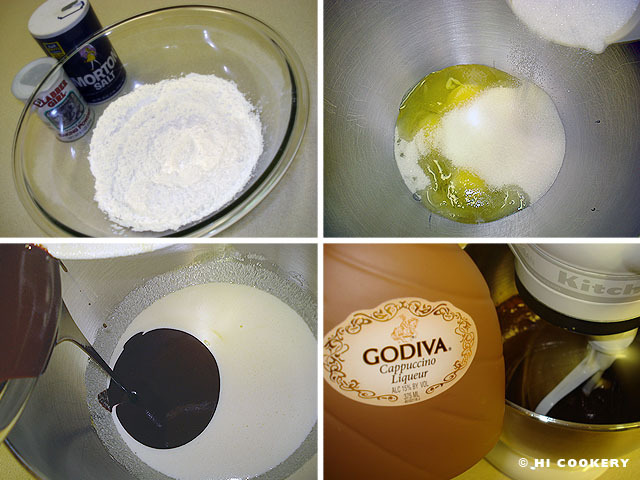 Prepare the chocolate ganache icing. In a microwave-safe bowl, melt the chocolate. In a small saucepan on the stovetop, heat the whipping cream over medium heat until bubbly, being careful not to burn the bottom of the pan. Pour over the melted chocolate and mix well. Stir in the corn syrup until well blended. Let set to thicken for about five minutes. Slowly pour the icing over the top of the torte, allowing it to drip down the sides. 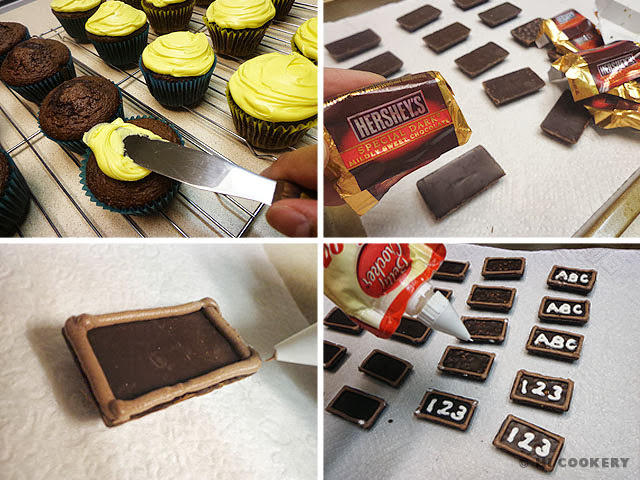 Use a spatula to smooth out the icing over the top and sides. Let set for around 10 minutes. Carefully transfer the torte to a cake plate, board or stand/pedestal. Decorate with a ring of pecan chips on top of the torte. Garnish the middle with the whole pecans. We used a Wilton cake lifter to transfer the iced torte onto a cake board. Nuts about pecans? Search our blog for more recipes using pecans as an ingredient. A fiesta is not complete without leche flan at the dessert table! Influenced by Spanish cuisine, this Filipino version of vanilla-flavored “milk custard” has a thicker texture and rich, sweet taste. When Islander prepares Pinoy-style leche flan with lots of leftover egg yolks from making macarons, she is too lazy to caramelize the sugar for the custard’s distinctively dark top. So she uses pancake syrup instead! But it still tastes terrific enough to take to potluck parties and to fiestas! 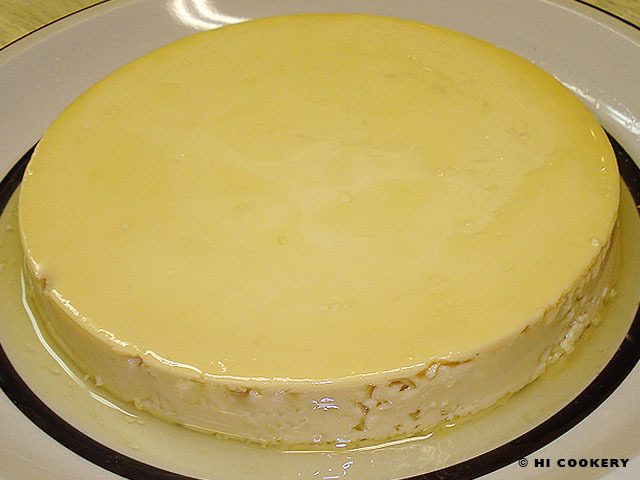 Celebrate National Vanilla Custard Day with a favorite Filipino food and try our easy leche flan recipe. Separate the egg yolks from the whites, reserving the latter for another recipe. 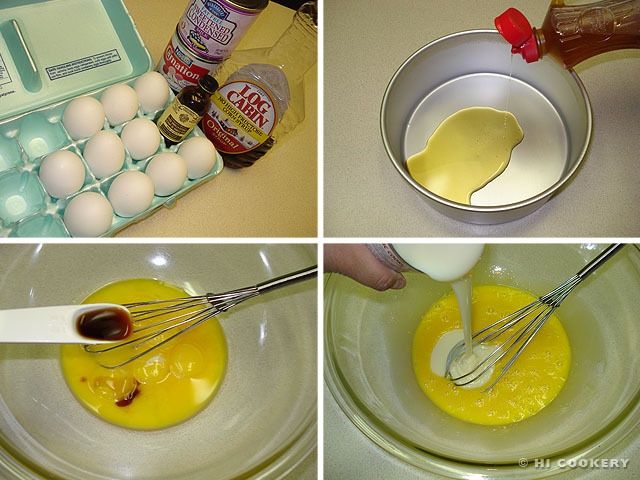 Pour pancake syrup in an 8-inch round pan and swirl enough of it to coat the bottom completely and moisten the sides. In a large mixing bowl, beat the egg yolks with the vanilla. 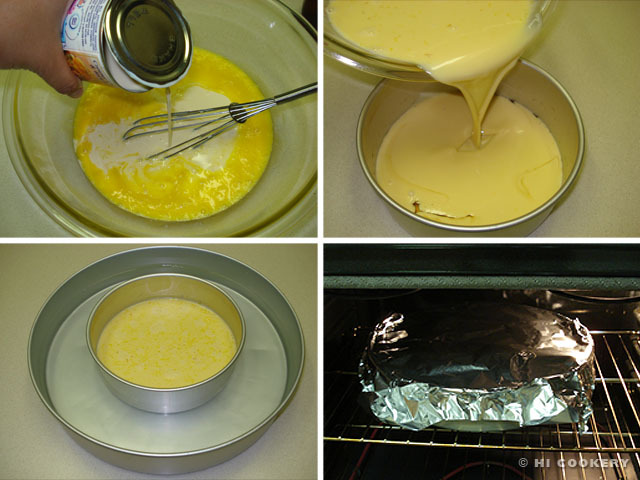 Stir in the sweetened condensed milk. Add the evaporated milk and blend well until smooth. Pour the mixture into the prepared pan. Let the bubbles settle as much as possible. Place this pan into another larger pan. Pour hot or boiling water halfway up the sides to create a steam water bath. Cover both pans loosely with foil. Bake in a preheated oven at 350 degrees F for at least an hour (depending on individual ovens, add 15-minute increments to the baking time). Remove from the oven, testing for doneness with a toothpick (it should come out clean after inserting it into the leche flan). When cooked, carefully remove the foil. Use a spatula to loosen the edges of the leche flan, allowing the pancake syrup to spread on the sides and top. Place on a wire rack to cool at room temperature. 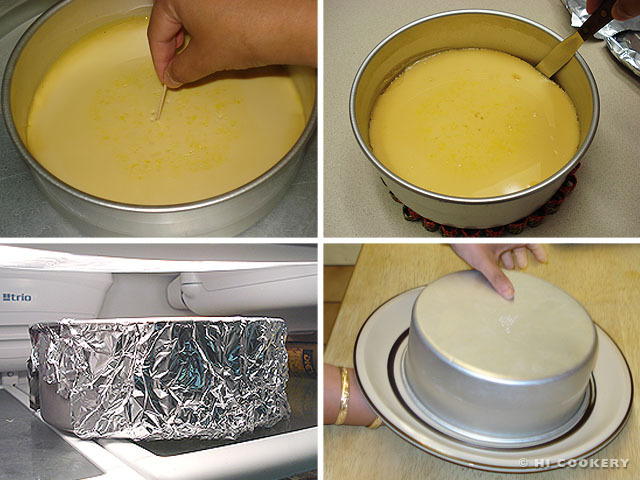 Cover the 8-inch pan with foil and refrigerate overnight to set. When ready to serve, remove the foil and place a serving plate on top of the opening of the pan. Carefully invert the plate, spooning some of the pancake syrup on top of the leche flan for a sweet gloss. Slice and serve. 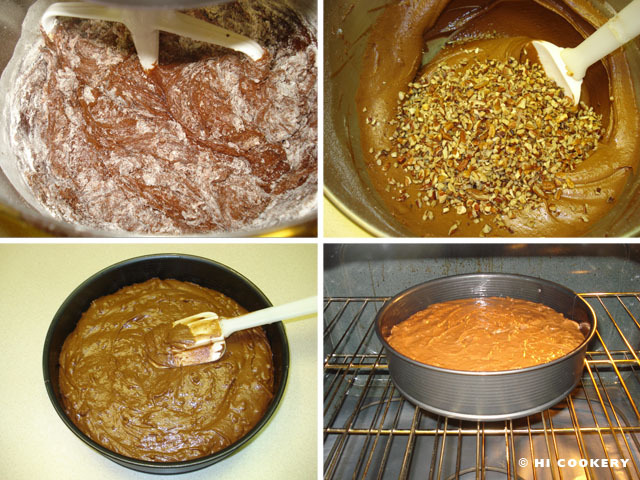 If there are too many bubbles after mixing the batter, use a strainer to pour into the prepared baking pan. Craving more custard? Try our similar recipes, such as cassava flan bibingka (tapioca custard cake), crème brulee and chocolate custard cups. The orange-cream-flavored popsicles we ate as kids now have a grown-up twist to them as a cocktail drink! Creamsicle is a brand name for frozen treats on a flat stick that consist of a vanilla ice cream center covered in a layer of fruit-flavored ice. 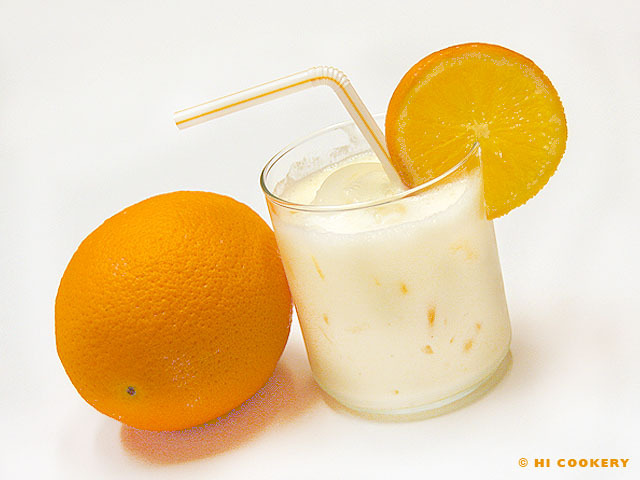 The cocktail version of an orange Creamsicle consists of vanilla ice cream, orange juice, orange liqueur and vodka over ice. During the dog days of summer, sip on this sweet and simple treat and cool off with a creamsicle cocktail on National Creamsicle Day. In a shaker, pour the vodka, orange liqueur and orange juice. Add a scoop of vanilla ice cream. Shake vigorously to blend the ingredients. Pour into a chilled cocktail glass filled halfway with ice. Garnish with a slice of orange. Insert straw and sip immediately. 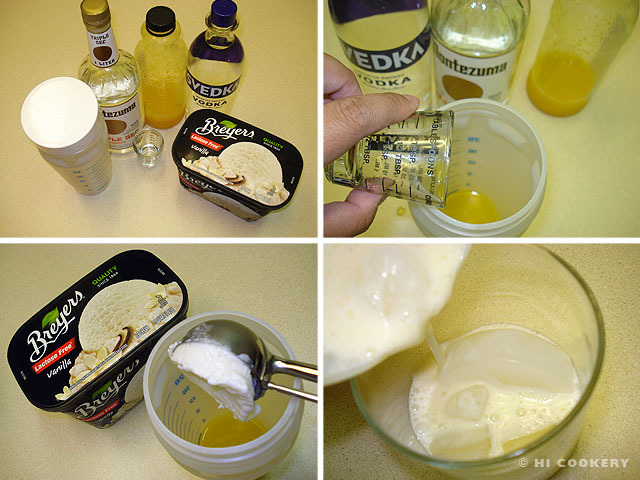 One ounce of cream may be substituted for the scoop of ice cream for a more liquidy libation. Fill a shaker with ice, vodka, orange liqueur and orange juice and cream, shake and pour into a glass. Whereas a Creamsicle has a vanilla ice cream center, the similar Dreamsicle has an ice milk center. 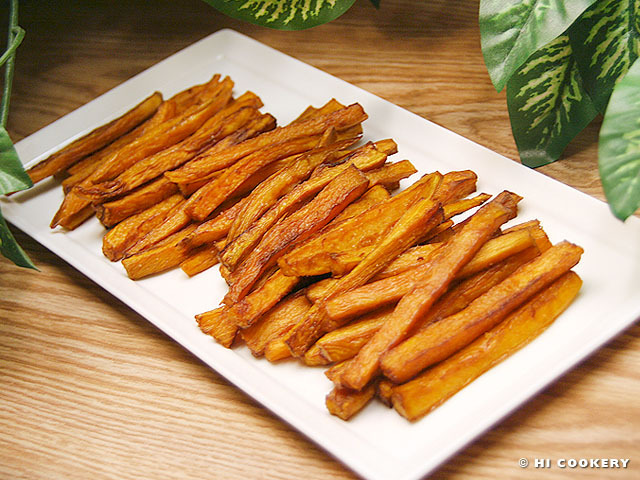 We posted a recipe for homemade French fries on National French Fries Day on July 13. Instead of regular potatoes, we used sweet potatoes in the recipe below. Although we like crinkle-cut fries, we do not have a fancy cutter so we just cut the potatoes into simple strips. The slicing technique used to describe “shoestring” style or long skinny slices of vegetables (or even meat and fruit) is called “julienne,” a French cooking term. 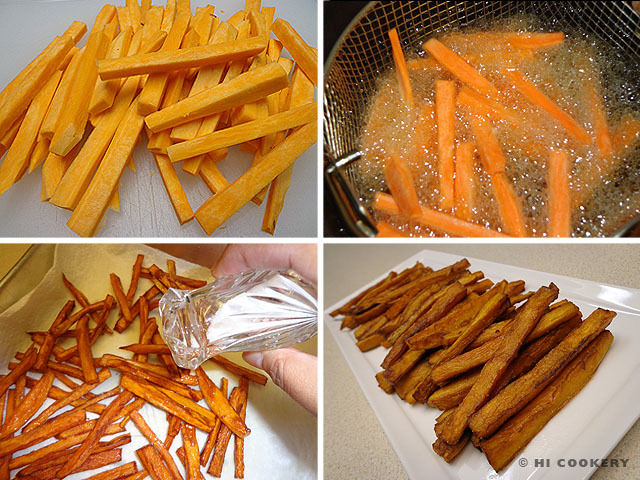 For National Julienne Fries Day, just slice up a sweet potato into thin strips and fry them up for a fast food fix! Wash, dry and peel the sweet potatoes. Square off the ends by slicing the tapered edges. Julienne them by cutting into thin strips, around 3-inches long and no thicker than ½-inch. Slice off any other curves to make the strips straighter. Heat the oil in the deep fryer. 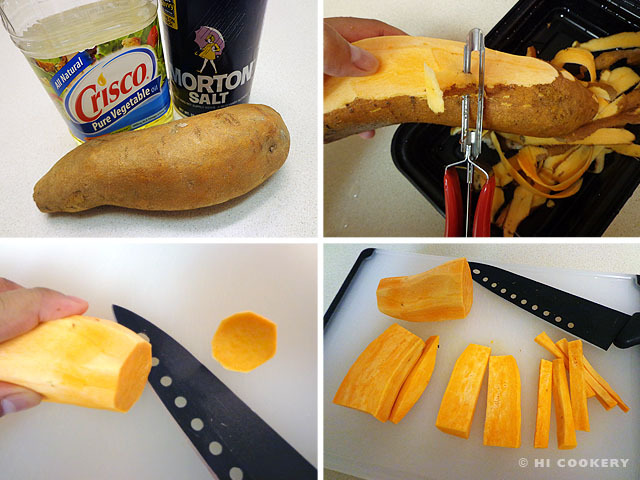 Carefully plunge the strips of sweet potatoes in the oil. Cook for 3-5 minutes, being careful not to burn the fries or overcook them. Drain the fries on paper towels. While still hot, sprinkle salt on them to taste. Serve immediately with your favorite dipping sauces, such as ketchup or garlic mayonnaise (optional). We often celebrate our birthdays and other special occasions by eating dinner and being entertained at Japanese steakhouses. The chef puts on quite a show as he cooks steak, shrimp or chicken in front of us. He also dramatically transforms sliced onions into a blazing volcano! The sliced onions are then sauteed with strips of zucchini and sometimes yellow squash, which make a superb side dish with our main meal. Teppanyaki-style vegetables are easy to prepare at home, although without the fire and flair. 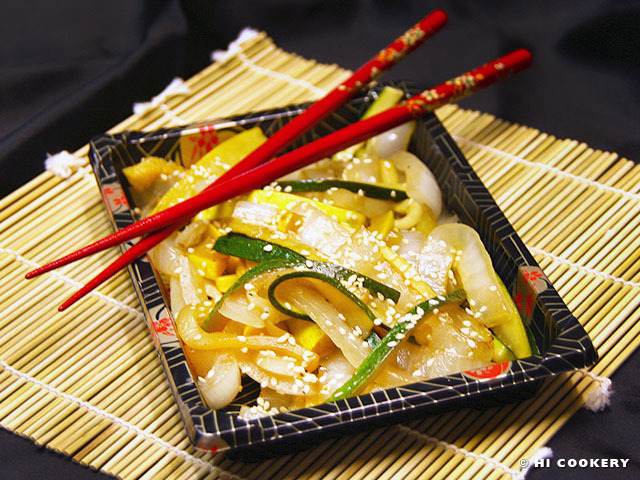 For National Zucchini Day, try this tasty teppanyaki-style zucchini, onions and yellow squash recipe. Cut off both ends of the zucchini. Slice in half then lengthwise into thin strips. Do the same for the yellow squash. Slice the onion into rounds but do not separate the rings. 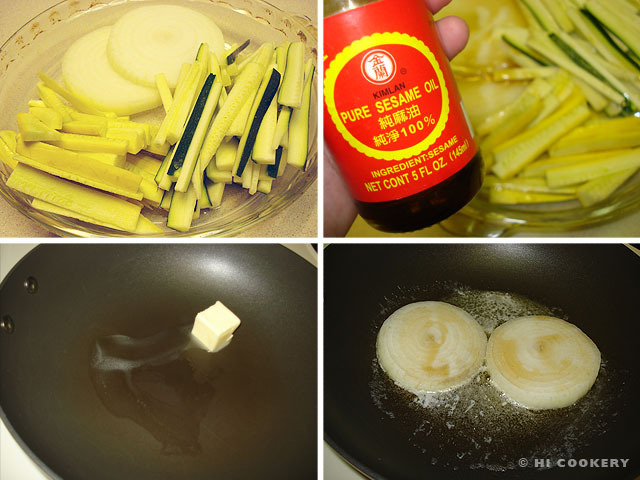 Place the vegetables into a flat dish, such as a pie plate, and splash with sesame oil. Melt the butter in a skillet/wok and heat the onion rounds for 2-3 minutes to brown. 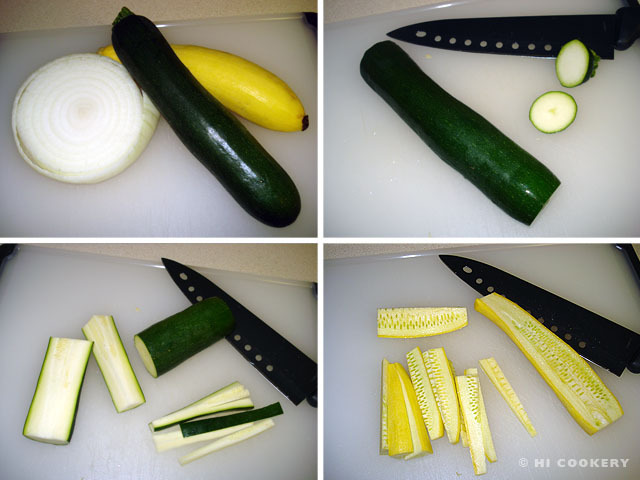 Add the strips of zucchini and yellow squash but do not mix. Season with salt and pepper. Meanwhile, remove the onion rounds from the skillet and carefully transfer to a cutting board and slice them into smaller strips. 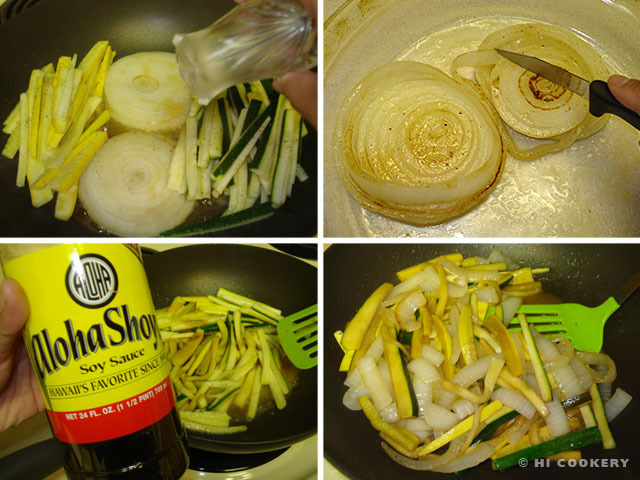 Return them to the skillet/wok and mix with the zucchini and yellow squash. Pour in the soy sauce. Saute until tender-crisp. Drain excess liquid. Transfer to a plate or bowl, sprinkle with sesame seeds and serve hot. Saute a cup of sliced mushrooms (white button) with the vegetables if desired. Traditional teppanyaki differs from a hibachi. The former refers to an iron griddle/plate whereas the latter is a barbecue grill that uses a charcoal or gas flame with an open grate design to cook food.